Compact black Gateway SX2865-UR26 desktop is about one third of the size of a standard desktop but faster and more efficient than most i3 processor machines in the market. It runs smoothly and quietly while consuming little energy. And now at a price not to be missed for such sleek and rather powerful machine at Amazon.com.. Smooth playback and beautiful images from its Integrated Intel HD Graphics and High-Definition Audio with 5.1 Channel Output providing intuitive surround sound and ability to get better enhanced performance than any type of speakers.. It also comes with Gateway Multimedia Keyboard for comfortable typing and an optical mouse. 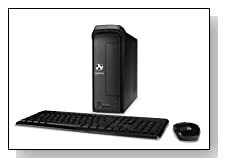 Glossy trim and soft matte black finish Gateway desktop weighs only 12 pounds and has 12.40 x 3.93 x 10.43 inch dimensions. It works very quietly, stays cool and its max output PSU is 90W so it is quite economical too (it won't use more than 30-40W during basic use). Although it has quite a small chassis, you will find a few connectivity options- with some at the front: 8 x USB 2.0 ports (2 front, 6 rear), Digital Media Card Reader- SD Card, 10/100/1000 Gigabit Ethernet LAN, 16X DVD±R/RW SuperMulti Drive, 1 x Audio-out Port, 1- HDMI port. Conclusion: Being so compact and light for a desktop, Gateway SX2865-UR26 brings some portability too- can be carried around easily and you can fit it anywhere (only 10.43 inch tall). The only negatives I can think of are the Windows 8 operating system (for some users) and the lack of a USB 3.0 port. But it certainly doesn't miss out on other useful features and specs. 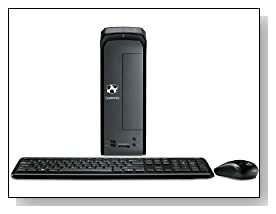 Perfect little desktop computer to use for day-to-day tasks to work at home or work that will handle anything other than high end games.. At an Amazon.com price hard to be beaten by competition.